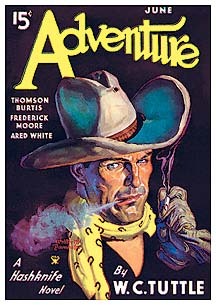 "Pulp Fiction": Strictly speaking, "Pulp Fiction" is a term which came into use originally to refer to many of the early, large-format fiction magazines -- published mostly during the 1920s, '30s and into the '40s. This somewhat pejorative reference comes from the use of the cheap, coarse pulp paper used in their printing. 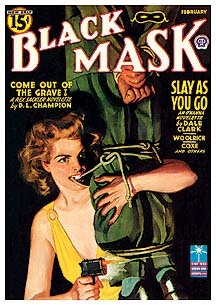 The "Pulps" were designed as inexpensive and sensationalistic "escape" reading for a public interested in mysteries, adventures, westerns, romance, fantasy and science fiction, among other genres popular then. 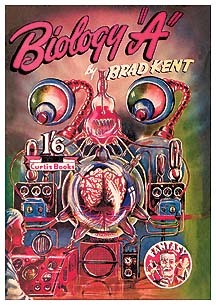 By the way, many of the popular and well-known paperback book cover artists actually began their careers as Pulp cover artists. 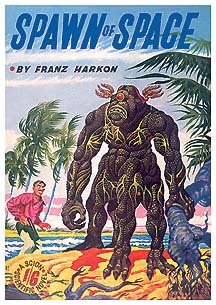 And, in fact, a number of the Pulp cover images were reused later on paperbacks. 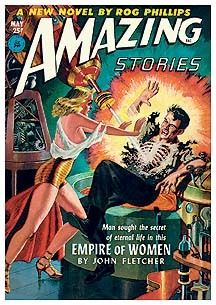 A future Pulp Notes will deal with this topic. Common usage of the term "Pulp Fiction" has caused it to evolve currently into somewhat of a more general description for most any type of cheap, often bawdy, and lurid reading material. 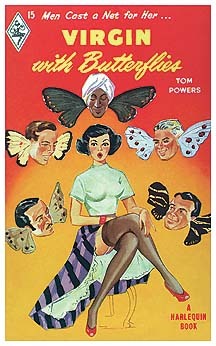 The film Pulp Fiction extended this notion into the realm of a tawdry underworld of "B-movie" characters and plots. 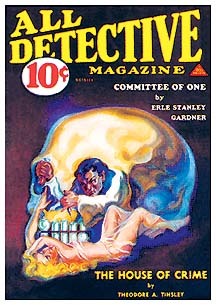 For further delvings into the world of the Pulp Magazine, check out the Related Web Sites on my Links page for leads to several Pulp Fiction-specific areas of interest on the Web. 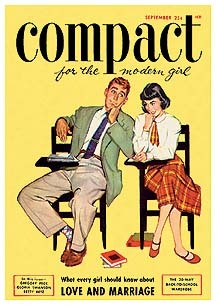 "Vintage Paperbacks": These are mass-market paperback books (the relatively inexpensive books in the 4 1/2" x 7" range; as opposed to the larger-sized, more "high-brow" and more expensive, "trade" paperbacks) published from their beginning in 1939 to the end of a so-called "Golden Age" of paperback publishing in 1959, some 20 years later. These books were characterized by their small, pocket-sized format and an initial cover price of from 25¢ to, perhaps, 95¢ by the latter 1950s. 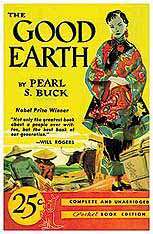 The American mass-market paperback really began with the publication, by Pocket Books, Inc., of an unnumbered version of Pearl S. Buck's The Good Earth in November, 1938 (image at top of page left.) This was the first 25¢ "pocket-sized" softcover paper-backed book aimed as an alternative to the price and size of the (then) $2.00 hardcover novel. As I understand it, Pocket Books, Inc. produced a test run of some 2,400-2,800 copies of The Good Earth (I've heard several numbers) and sold them as a marketing and sales test at Macy's department store in New York City. 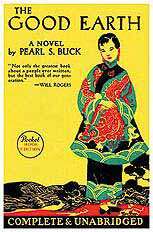 This test was hugely successful and in early 1939 Pocket Books, Inc. went into full production by releasing their first 10 numbered titles, beginning with Pocket Book #1, James Hilton's Lost Horizon. (By the way, The Good Earth was later re-released that same year, with a slightly different cover, as Pocket Book #11, shown at top of page right.) And so began the era of the mass-market paperback book. Where can you find vintage paperbacks? Check my Book Dealers page for contact information on finding and purchasing them. 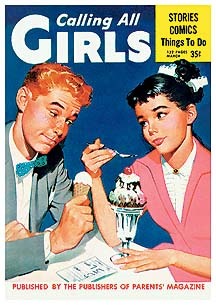 There you will also find information on a bi-monthly publication called Paperback Parade. See my Links page for Mark's online auction site, and check any local garage sales, thrift, "collectibles," and used book stores for some of these treasures. I have had some of my best "finds" in second-hand, "junk" stores, where a small stack of paperbacks in a corner would yield a treasure or two. 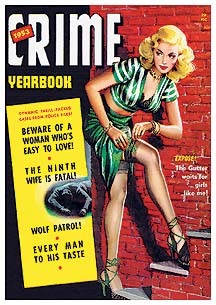 Of course, within both these segments of 20th-Century American publishing industry -- the Pulps and paperback books -- the cover art produced for the thousands of magazine and paperback titles proved to be one of the main lures for selling to the buying public. The very nature of this colorful, graphic, bold, appealing and often promising-much cover art attracted many, mostly male, readers. And as outrageous and scintillating as some of this cover art is, few, I think, would deny that, on the whole, it was skillfully done. It's a sad lament on the publishing industry back then that most of this original art was destroyed, and most of the paperback book covers are unattributable to a particular artist. One of my aims in producing this line of postcards is to bring this vanishing art to the general public, an art form which, until now, has largely been hidden or unavailable to all but a relatively small number of collectors. 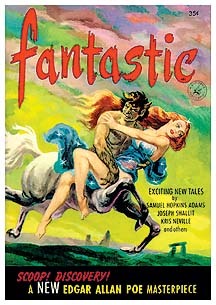 I'll speak much more about the aspects of cover art and the cover artists in future Pulp Notes. 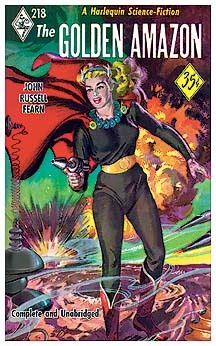 Comments, questions, and ideas for future Pulp Notes topics are always welcome. 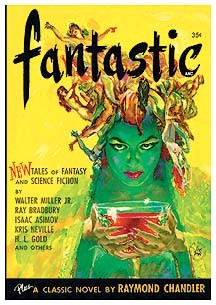 In future Pulp Notes I'll include topics about genres, publishers, artists and authors, and something about the paperback collecting hobby itself. With my large paperback collection -- and these postcard images -- I'll be able to provide examples to illustrate these topics. Thanks for your interest and support of this business venture. 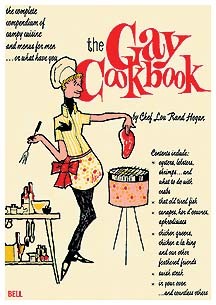 I sincerely hope that you get some of the same kind of enjoyment my wife Sharla and I do in these seeing these campy cover images and the catchy tongue-in-cheek titles and cover blurbs. 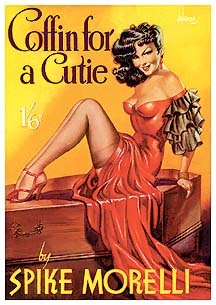 I plan on putting out a Pulp Notes Letter every four to six weeks and in the next issue I'll go into the beginnings of my own vintage paperback collecting, and computer and graphics background, and how those elements came together in a brand-new venture for me: publishing a line of postcards! Pulp Fiction Postcard Images copyright © 1995-2004 Jeffrey Luther / PC Design. All Rights Reserved. Pulp Notestm and Text copyright © 2002-2019 Jeffrey Luther / PC Design. All Rights Reserved. PC Design, P.O. Box 4336, Palm Springs, CA 92263 U.S.A. 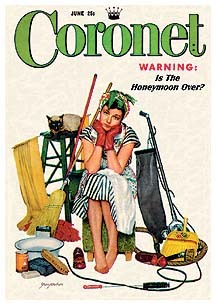 The Fine Print: To the best of my knowledge and ability, I shall be as accurate as I can in these Pulp Notes. However, Jeffrey Luther / PC Design shall not be liable for any errors, factual or otherwise, which may creep in. And while I may solicit information from other sources, any errors are my own. Publishers' names and logos, whether by reference or by cover image, are trademarks of their respective holders.